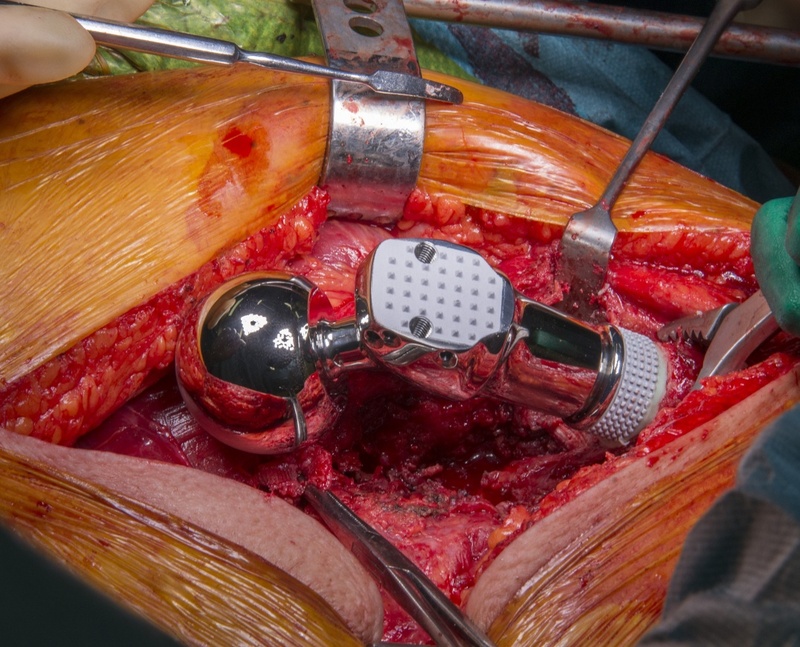 Learn the Endoprosthetic proximal femoral replacement (Stanmore METS system , Stryker) with trochanteric reattachment for pathological femoral fracture . surgical technique with step by step instructions on OrthOracle. Our e-learning platform contains high resolution images and a certified CME of the Endoprosthetic proximal femoral replacement (Stanmore METS system , Stryker) with trochanteric reattachment for pathological femoral fracture . surgical procedure. Endoprosthetic replacements of the proximal femur are one of the most common limb-salvage procedures undertaken to reconstruct massive bone defects secondary to tumour, trauma or infection. The increasing burden of metastatic bone disease means more cases present to orthopaedic surgeons. Breast cancer is the most common cancer in women and because of advances in systemic therapy, is considered a chronic disease. Two thirds of breast cancer patients will develop skeletal metastases which cause skeletal related events (SREs: pathological or impending fracture, hypercalcaemia, spinal cord compression, severe pain) which may require surgery and/or radio- therapy to palliate pain and to preserve mobility and quality of life. For patients with subtrochanteric bone tumour involvement, fracture and patients with a good prognosis may best be managed with endoprosthetic replacement. Resection of a tumour from the proximal femur requires reconstruction of the large bone and soft-tissue defect and the complications of such surgery from a systematic review include dislocation (5.8%), infection (5.2%), local recurrence (4.7%) and peri-prosthetic fracture (0.6%). These are both reliable and durable implants that offer immediate mobility and return to function; however in the long-term complications and failure mean that ten year implant survival is approximately 75%. Institution :The Royal Orthopaedic Hospital Birmingham ,UK.